I've been to quaint French bistro June's All Day for lunch, happy hour, and even a solo burger dinner at the bar--but I'd never been to brunch! So, last Sunday, I decided to rectify that situation before heading to the Palmer Events Center for the second day of POP Cats (yes, that's a cat convention). 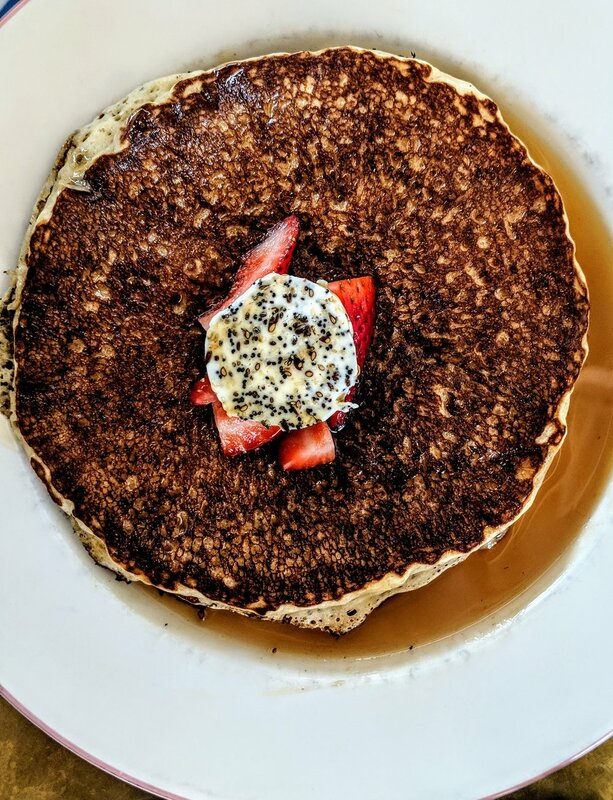 Full disclaimer: When I was doing research for my Eater Austin pancake roundup, my boyfriend read the words "sourdough pancakes" on the June's menu and insisted he needed to try them ASAP. We killed multiple birds with one stone and sauntered to the SoCo hotspot to brunch Parisian style! First of all, I adore June's. I love the wine list, and the burger is divine. The happy hour is hella dope (everything is half off on the food menu. EVERYTHING!) But, it's truly like a Parisian cafe, and all the tables are pretty tightly jammed together. So, once you get over your boundary issues, brunch is about to get delicious. My boyfriend and were starving so we ordered the appetizing board to share off the smaller plates menu. It was definitely large enough for one person's breakfast! The board came chock-full of salmon pastrami and wasabi and tobiko cream cheese, an incredible onion and poppy bialy, and all the accouterments of red onions, capers, and sprouts. I almost licked the plate clean of that cream cheese, y'all! The BF got the aforementioned sourdough pancakes, which came topped with strawberry jam, some sort of delicious seeded butter, and a healthy pour of maple syrup. The sourdough made the cakes slightly tangy, but in all the right ways. While he went sweet, I went the savory route with a super classic French breakfast of slices of ham and Gruyere cheese with eggs (I chose over easy but wish I would have gone scrambled), buttered English muffin, and orange marmalade. I would have eaten that ham and cheese forever, and took me right back to last summer when we vacationed in France. Le sigh.